Peter Coyote, star of film and stage, also just happens to be an author as well! 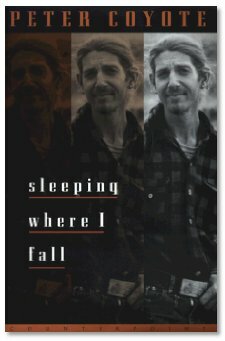 His book, sleeping where I fall (case intentional), is a personal memoir of his life and times spent with an amazing radical street group called The Diggers. Peter takes some time to explain the basic premise to the book to us, which has enticed both of us to rush out and get a copy! Mel Gibson signed for "Fury Road - Mad Max 4"
The Science of Harry Potter - Buy the Book! Buffy could be back... if she'll take $750K per episode? X2 to "kick as in May 2003"
Evo, bringing out the super smart uber-gorilla books. I read Ishmael in college, and always wanted to bend the author's ear. I guess his website is the next best thing. Thanx.